Here at the Bodmin & Wenford Railway we are committed to keeping our railway heritage alive - but we can’t do it without your help. The cost of running a steam railway in the 21st century, even when 90% of the staff are dedicated volunteers, continues to rise. We’re working hard to ensure that passenger revenues and income generated from our varied programme of events, gift shop and cafés cover our day to day operations, but investment for the future increasingly relies on donations and gifts in Wills. The Bodmin & Wadebridge line was one of the first railways in the world to use steam locomotives and certainly the first in Cornwall. As well as preserving this important piece of history, the Bodmin & Wenford Railway is also a popular tourist attraction, bringing in thousands of people each year to share in the celebration of our heritage. We also have plans for the future which will allow us to continue our work in conserving artefacts and documents, restore locomotives and coaches and build new facilities. If you would like to support the future growth and development of our wonderful railway, then we need your help! Every donation received is appreciated and allows us to continue our important work in the preservation and improvement of our Railway. No matter how large or small, your gift will make a lasting difference. 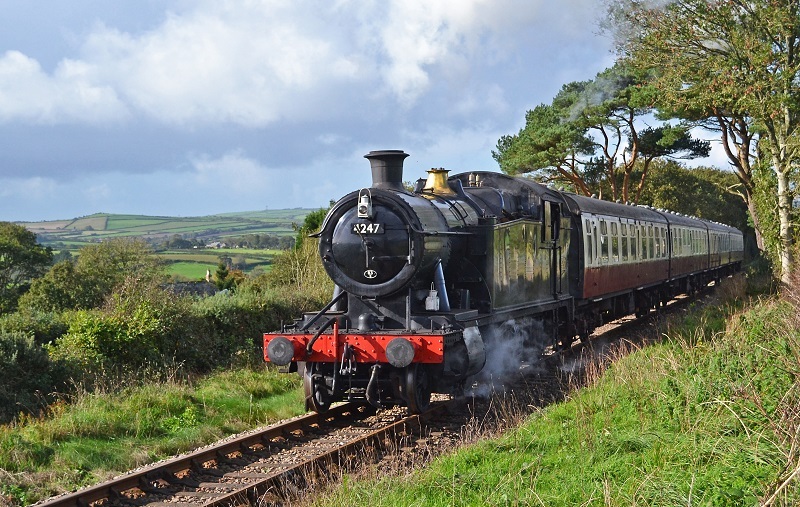 Donations to the Bodmin & Wenford Railway Trust qualify for Gift Aid, which means that we receive an additional 25p for every £1 you give, making your donation go further to help support us. See www.hmrc.gov.uk for further details. Far from being a gloomy subject, we see the idea of leaving a Gift in your Will as a celebration of your support, which will help enable us to continue doing the fantastic work that we are so passionate about. Leaving a gift in your Will doesn’t need to be a big deal – you can choose to tell us about it or not, and you can leave as much or as little as you like. Any gift, large or small, is always appreciated. If you wish to support our work in another way you could leave instructions, either as a Codicil to your will or with your loved ones, to donate the proceeds of a collection in lieu of flowers at your funeral. You do not need to inform us of your intentions, but we would love to hear from you so that we are able to thank you for your kindness. If you’re considering leaving us a gift in your Will, thank you. You can be secure in the knowledge that every penny of your gift will be put to good use, will benefit the next generation of rail enthusiasts and will help to secure the future of live steam in the heart of Cornwall. If you already have a Will, you simply need to contact your solicitor and inform them of your decision. You’ll also need to give them our Charity details, you can find these below. If you don’t already have a Will, then you will need to make an appointment with your solicitor to write one. Many solicitors throughout the country offer free Will writing services, or opportunities to write a Will in exchange for a donation to charity. If you have any questions about the process of making or changing a Will, your solicitor will be happy to advise. You don’t have to inform us if you’re planning to leave us a gift, but we would be delighted to hear from you so that we are able to thank you for your kindness. Should you wish to make a donation or discuss leaving a gift in your Will, please contact Steve Ackland or a member of the team at Bodmin General. Your enquiry will be treated respectfully and confidentially, and your support will be very much appreciated.